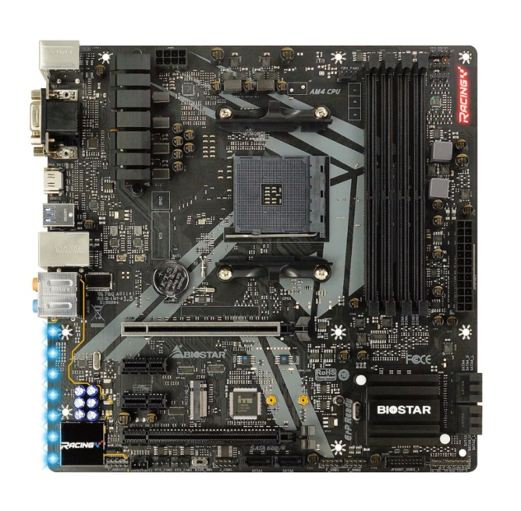 August 2, 2018, Taipei, Taiwan – BIOSTAR adds a micro-ATX RACING B450GT3 motherboard featuring the newly released B450 chipset for mid-ranged motherboards that support the first and second generation AMD Ryzen processors. The BIOSTAR RACING B450GT3 is packed with features found in high-end gaming AM4 motherboards: complete management of RGB lighting with VIVID LED DJ and 5050 LED FUN ZONE, Dual BIOS for auto recovery, Iron Slot Protection which is built on the BIOSTAR signature premium black RACING themed PCB design. The RACING B450GT3 motherboard is built for gamers that demand high-performance on a micro-ATX form-factor. It supports 4-DIMM DDR4-1866/2133/2400/2666/2933/3200(OC) with up to 64G maximum capacity, 1 x USB 3.1 Gen2 Type-C port(10Gb/s), 1 x USB 3.1 Gen2 Type-A port (10Gb/s), 1 x M.2(32Gb/s) and 6 x SATA3 connectors. Gamers will also appreciate the Hi-Fi 7.1ch HD Audio for true immersive sound quality that is enabled with the Realtek ALC1150 7.1-Channel Audio. Two 5050 LED headers that support a wide variety of RGB lighting devices such as LED fan, LED DDR4 module, and LED strip. The exclusive Iron Slot Protection can reinforce PCI-E x16 slots to handle heavier graphics cards to prevent bending and sagging. 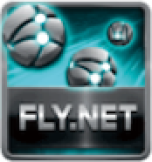 AMD AM4 RACING motherboards come with the exclusive utility FLY.NET, which can optimize the Internet connectivity for gaming. 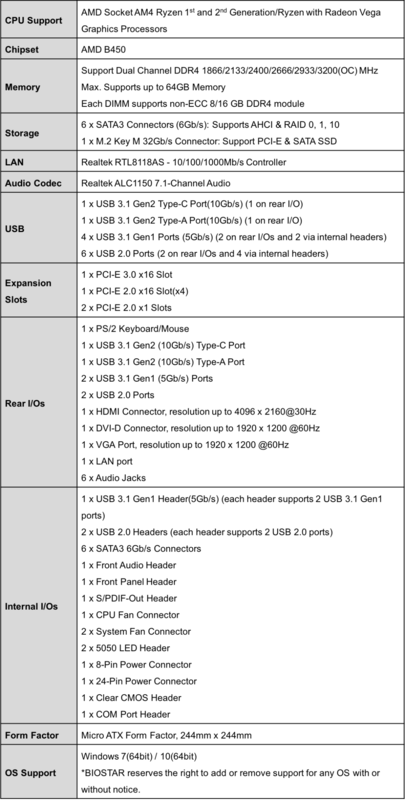 The BIOSTAR RACING B450GT3 motherboard’s rear I/O ports includes: 1x PS/2 keyboard/mouse, 1 x USB 3.1 Gen2 (10Gb/s) Type-C Port, 1 x USB 3.1 Gen2 (10Gb/s) Type-A, 2 x USB 3.1 Gen1 (5Gb/s) Ports, 2 x USB 2.0 Ports, 1 x HDMI Connector (resolution up to 4096x2160@30Hz), 1 x DVI-D Connector (resolution up to 1920x1200 @60Hz), 1 x VGA Port (resolution up to 1920x1200 @60Hz), 1 x LAN port and 6 x Audio Jacks. 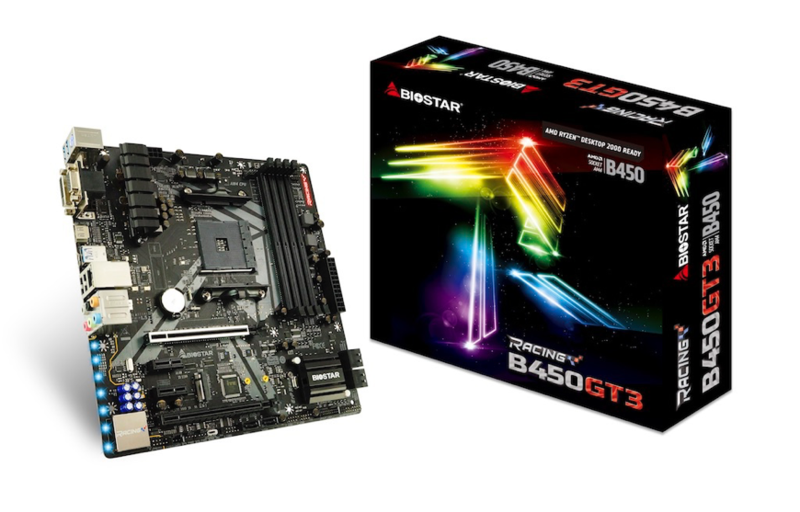 The BIOSTAR RACING B450GT3 is the latest AMD AM4 motherboard that supports the first-generation and second-generation AMD Ryzen processors for mainstream gamers looking for a powerful middle-range micro-ATX motherboard.